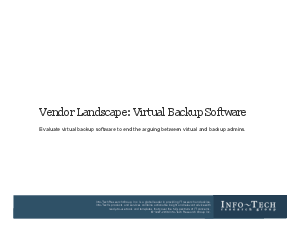 This independent report from Info-Tech evaluates and scores 14 companies in the Virtual Machine Backup market. It can help you understand what's new in the virtual backup market, evaluate virtual backup vendors and products for your needs and determine which products are most appropriate for your organization. Find out why Symantec was named a “Champion” in virtual backup software.